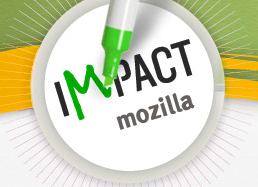 Impact Mozilla, Thunderbird 3.0b1, and Firefox 3.1b2! Voting has begun for the Impact Mozilla contest, and after taking a look at all of the finalists, I was very excited to see that about half of them involve using add-ons to promote Firefox and increase retention. Check out the finalists and vote before next Wednesday! Today, Thunderbird 3 beta 1 was released. I tried it out and immediately switched to using it as my default client. The upgrade from 2.0 was seamless, and I’m really enjoying the new features and interface. 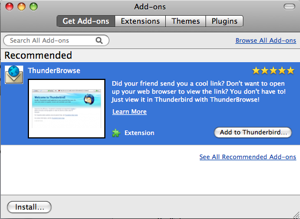 Of course, one of my favorites is the new Add-ons Manager, first introduced in Firefox 3. It will now be possible to install extensions from AMO directly in Thunderbird by searching for them in the Add-ons Manager. Speaking of beta releases, Firefox 3.1 beta 2 was released yesterday with Private Browsing mode, TraceMonkey turned on, and one of my favorite less-announced features: being able to drag the window around on Mac from any part of the chrome (also available in Thunderbird 3.0b1!). Lots of exciting things so far this week, and it’s only Tuesday!